Many people upgrade computers every few years and so there is a requirement to transfer email between computers. In this tutorial we look at how you can move email and contacts on windows live mail (WLM) from an old computer to a new computer. When moving Windows live mail the procedure is actually very simple as Windows live mail stores all of the emails, and email settings in a single folder. By copying this folder to a new installation of windows live mail you move all the email and email settings in one go. Important! -You still need to export and import the contacts. Both computers must have Windows live mail installed. Export Windows Live Mail Contacts to a .csv file on a USB stick. Copy the Windows Live Mail folder from the Old Computer to a USB drive or across the network. The video below takes you through copying the folders to move the email and email settings it doesn’t cover the contacts. The contacts folder opens showing your contacts . Click on the down arrow in export icon in the upper menu bar. Select the fields and a destination file location and name to export the file. Transfer the file to the new computer, open WLM, select contacts and import. 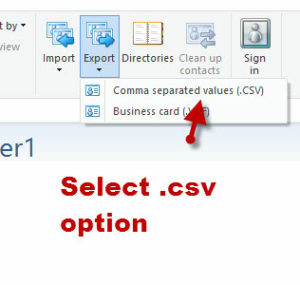 Select the .csv option for the import and import the contacts. 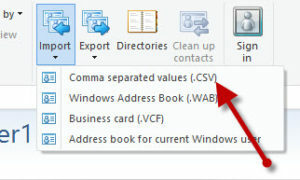 The contacts are store in the windows live folder under contacts and not in the WLM folder. Note: Instead on doing the export/import you could copy this folder from the old computer, and replace the one on the new computer. Q- What happens to the old installation can I still use it? A- Nothing happens to it, and it is still usable. Q- Can I access my email using Windows live mail on two computers? A- Yes providing the email accounts are using IMAP4 then you can access using as many email clients as you want. Q- Do I need to create the email accounts on the new computer? A- No if you do they will be overridden when you copy over the WLM folder. Change from POP3 To IMap4. Understanding and editing ,csv files.